For the card game, see Botifarra (card game). For the obscene gesture, see Bras d'honneur. Botifarra (Catalan pronunciation: [butiˈfarə]; Spanish: butifarra; French: boutifarre) is a type of sausage and one of the most important dishes of the Catalan cuisine. Botifarra is based on ancient recipes, either the Roman sausage botulu or the lucanica, made of raw pork and spices, with variants today in Italy and in the Portuguese and Brazilian linguiça. In Colombia, Butifarras Soledeñas are a popular tradition in Soledad, Atlántico. Raw botifarra, botifarra vermella or botifarra crua, or roget. 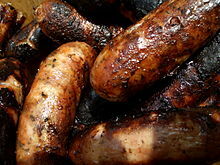 It is also known as llonganissa in many places of the Catalan cultural area. This botifarra is usually grilled or barbecued. Black botifarra, botifarra negra or negret, containing boiled pork blood in the mixture. Botifarra catalana, large botifarra similar to cooked ham; it may contain truffles. Botifarra d'ou (literally "botifarra with egg"), containing egg in the mixture, typical to be eaten on Fat Thursday, dijous gras. White botifarra, botifarra blanca or blanquet. Its main ingredient is fat-less meat (carn magra). It does not contain any blood in its mixture. Botifarra d'arròs (literally "botifarra of rice"), contains boiled rice together with meat and spices. Bisbe (meaning "bishop") and bull, as well as bisbot negre' and bull negre, are thick blood botifarra varieties made with different sections of tripe. Both bisbe and black botifarra are versions of black pudding. Usually white botifarra and black botifarra do not need to be cooked, but they are sometimes boiled as an ingredient Escudella i carn d'olla, a traditional dish made by boiling vegetables and meat, as well as in the Catalan way of cooking fava beans. Grilled botifarra served with white beans (Catalan: botifarra amb seques or botifarra amb mongetes) is a typical Catalan dish. In South America cooked botifarra of many types are known as butifarra. In Colombia in the town of Soledad and also in Barranquilla, butifarra is a dryed, shorter, almost round version of the sausage eaten with bollo of yuca and lime juice. In Argentina and Uruguay, butifarra a is a very fatty, tender and whitish sausage much more like a cased pate, rioplatense butifarra is made with finely minced pork fat and meat that is cased in a soft sausage case and boiled. In Paraguay, butifarra is a finely minced fatty chorizo that is commonly prepared in asado. Butifarra is popular in El Salvador, also known to be found in Bolivia and Mexico. The word butifarra In Perú, is used for a sandwich not related with any sausage at all, it is prepared with jamon del país, a regional type of ham and not a botifarra. ^ "Butifarra Limeña - Recetas de Comida Peruana". Recetasdeconidaperuana.org. 25 March 2013. Retrieved 8 October 2018. Wikimedia Commons has media related to Botifarres.